Figure 1: The percent of average precipitation for the CA and NV region during water year 2018. Water year 2018 (covering October 2017 through September 2018) was drier than normal almost all the California and Nevada region (Figure 1). Much of the southern region in CA and NV received less than 50% of average precipitation. Such low values are typically seen in Southern California less than 1 year in 20. Several stations had extreme dryness comparable to the lowest seen in the observed record, including Miramar, Julian, San Gabriel, La Crescenta, and Santa Ana. Local exceptions to the dry conditions were the central and northern Sierra Nevada region and Pershing County and northwest Clark County regions in Nevada. The water year was extremely dry at the start in October and November, leading to dangerous fire conditions during the main Santa Wind season. These dry conditions and a prolonged strong Santa Ana wind event contributed to the second largest fire in CA history, the Thomas Fire, which started on December 4 and burned over 280,000 acres in Santa Barbara and Ventura counties. . There were several late-season storms in March and April that increased precipitation totals from below 50% to over 70% (Figure 2) for the entire state of California. 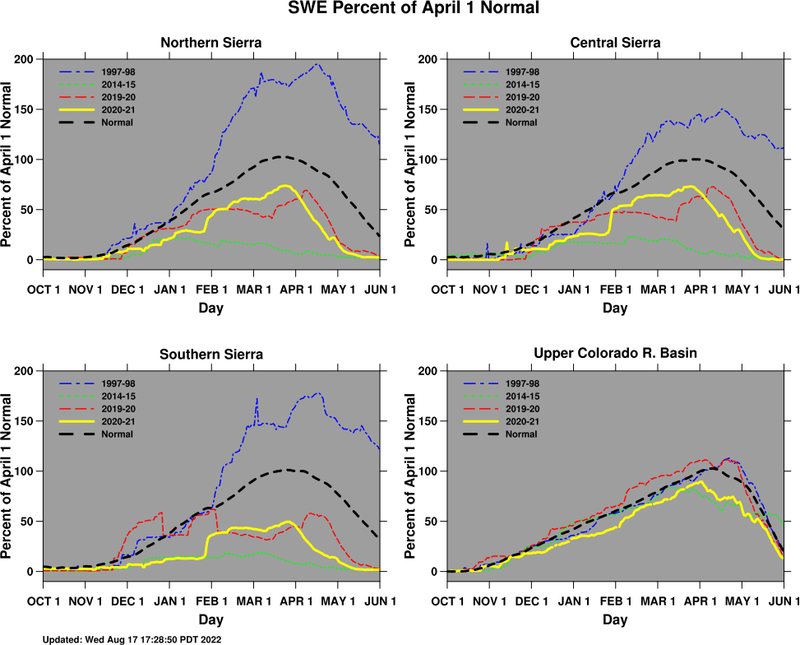 In the Sierra Nevada, snowpack water content climbed from 23% of normal on March 1 to 54% of normal on April 1. These late season precipitation events also increased precipitation totals in the western Great Basin. Early monsoon season (July) precipitation in southern Nevada pushed the water year total to 78% of normal after a drier than normal winter (Figure 3). Figure 2. The daily precipitation change as percent of normal for all of California. The blue shade region shows middle 2/3 of years. The read line is water year 2018. Figure 3. Same a figure 2 but for Clark County, Nevada (Las Vegas region). Figure 4. The water year % of normal total for the San Diego County region. Since 1947, 4 of the 5 driest years have occurred in the 21st Century. Southern California experienced an exceptionally dry winter; it was the 4th driest water year since 1947 (Figure 4). The precipitation record for San Diego shows that 4 of the 5 driest water years have occurred in the 21st century. This is also true for the Los Angeles Basin (not shown). Future climate projections indicate an increase in precipitation variability, which includes more droughts and dry years punctuated by extreme storms. Recent dry years (e.g., 2011 through 2016) have been exacerbated by well above normal temperatures, which enhance drought impacts. Stay up to date on this year’s precipitation totals with the CNAP Drought Tracker. CA Department of Water Resources Annual report. NIDIS year end summary report.